This workshop is for writers who want guidance in completing their book-length first-person work. We’ll mine your personal stories for the universal truths you have to share with readers. We’ll tackle the challenges every memoirist faces, like how to tell your version of the truth while dealing with friends and family who may remember things differently and how to dig deep for the real story underneath the story. And we’ll reinforce nuts and bolts like structure, pacing, and how to flesh out characters when those characters are real people from your life. Each week, in addition to general discussions of craft, we’ll dig into your pages as a group. Writers may bring in up to seven pages each week, which we’ll read and discuss in class. There’s no requirement to read each other’s work outside of the classroom, but everyone is expected to participate in discussions so you can all benefit from each other’s feedback as well as mine. Feedback will be tailored to wherever you are in the process and whatever you’re struggling with most. This workshop is designed for memoirists with a work-in-progress, though a complete manuscript is not required. Feel free to send us an email or to call us if you’re uncertain about whether this workshop is for you. 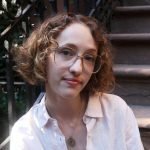 Instructor Lilly Dancyger is the deputy editor of Narratively, where she oversees the memoir section. Her first book, Hunted: A Memoir of Art and Addiction is forthcoming from Shanti Arts Press, summer 2018. Her personal essays have appeared in Psychology Today, The Washington Post, The Guardian and more. She teaches memoir and personal-essay writing at Gotham Writers’ Workshop and Catapult, in addition to the Fairfield County Writers’ Studio. Her students have published work in publications including Rolling Stone and Longreads. Learn more about her at LillyDancyger.com. Follow her on Twitter here. I’m somewhere in the middle of a memoir and feel like this is a good time to get some ideas about overall shape, as well as another opinion on fleshing out scenes and characters. I’m interested in your October memoir workshop. Hi Gail! I’m sorry I didn’t realize there were comments on this page until just now… But yes I’d love to help you bring your project to the finish line!